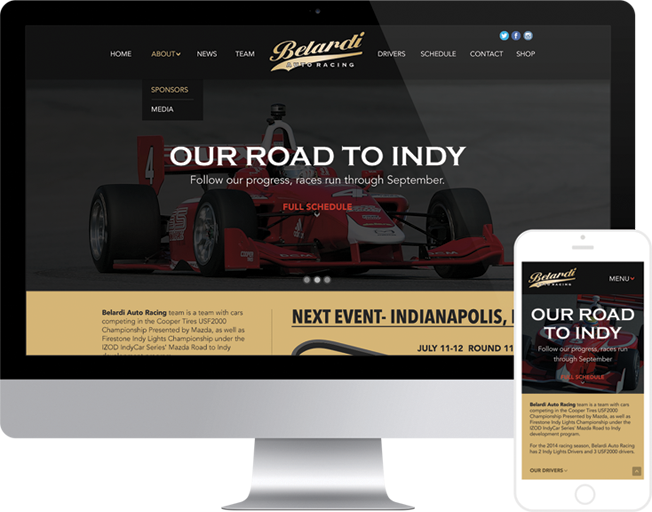 Located minutes outside of the Racing Capital of the World in Brownsburg, Indiana, The Belardi Auto Racing organization is focused solely on the 2016 Indy Lights, Presented by Cooper Tires, series. We spent a considerable amount of time researching the Indy Lights Series, participating teams and features throughout. We found that the three important must haves are: schedule, social and news. With a strong following, the team was in need of an effective way to showcase these features across multiple platforms. We designed them an eye pleasing, user friendly, responsive website that unifies both the website and social presence. As a fully SEO'ed and user friendly site, the above images showcase and easy to use drop down mobile navigation, along with the core features displayed right on the home page. Outside of the key features, the pages are elegantly designed to showcase the drivers and team, among others, while maintaining consistency to support the easy and effective user experience.